Soup is a starter dish, it is served before meal. The consistency may be thick or thin, I prefer thin soup!!!. When I was in UK, thick soup is served as lunch with garlic bread in TGFS( Fast food shop). My colleague used to buy this everyday for lunch. She use to say, this is a good way to avoid junk food and to maintain ur weight!!!. In south Indian restaurant, most famous soup is vegetable soup with basmati rice stew. I love that, it is very light starter for meal. 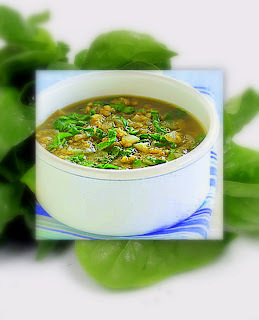 Here I have given Lentil and spinach soup recipe which is thick and has healthy benefits!!! In a pressure cooker, saute the onions, garlic and tomatoes in oil. Add spinach, toor dhal and 4 cups of water. Close the cooker, bring to full pressure on high heat. Reduce the heat. Cook on low heat for further 10 mts. Turn off the heat and allow to release pressure. when cool blend in the mixer or u can blend in a spatula so that u can feel dhal and spinach . Heat milk and to the soup. Add the chilli powder and salt and bring to boil. Serve hot with dash of lime juice and pepper!!! !